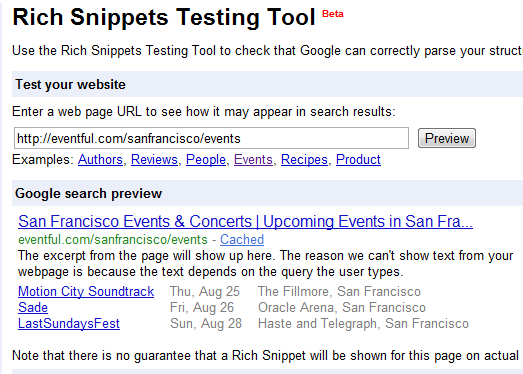 Want google rich snippets for your events? If you are using amr-events or amr-ical-events-list plugins with a url for your events, then the markup is already all there for the rich snippets. You may already have improved structured search results. When event information is marked up in the body of a web page, Google can identify it and may make that information available in search results pages. Information such as an event’s title, date, and venue can help users decide which pages to click on in search results. There is a rich snippet testing tool to check whether your event markup is good enough. Enter the url of a page with your event calendar or widget. Note: if there is more than one event on the page, then google requires that the event url be included in the markup. Google requires that the event url be on the same domain as the web page. Although many ics editors do not allow you to enter a url, my amr-events plugin will sort that out for your site. If you are using amr-events, then you have no problem, the event post is the url. If you are only using amr-ical-events-list, never fear, by using a “calendar” url in the widget so that the event summary become hyperlinks, the ‘class=”url”‘ markup will be added and google will be happy. Google also requires that the date fromat be in a ISO 8601 format so that it is understood. This means that some calendars are not ok with google – Google does not understand german weekdays! I will bear this in mind – there may be a way to meet both requirements.